Chris would like to thank the following sponsors for there valuable help. As they are a key factor in enabling him to keep his equipment to the highest standard. European Plant & Machinery Sales specialises in the sales of Mini Digger, Excavators and Plant equipment, both operated and self drive. We supply to customers ranging from main contractors in the construction industry to the Trade & DIY. Manufacturers of Speedway & Grasstrack Equipment as well as custom CNC and Milled components. Based on Hayling Island in Hampshire. Havant Motor Factors has been supplying the motor industry quality car components for over 25 years. We are a family owned business who pride ourselves on having some of the best staff in the industry all backed up with a stock holding in excess of a quarter of a million pounds. We are experienced in waste cleansing, disposal and management. Rock Oil is one of the UK's leading Motor Racing Oil companies famous for quality and success. Although famous for racing we also supply quality oil for virtually any motor vehicle. Lazer are one of the worlds leading helmet manufacturers. Supplying top quality helmets with excellent protection and stylish designs. The Worlds leading Spark plug manufacturer and makers of all types of spark plugs for millions of different types of vehicle and race machines. The Worlds leading Air Filter Manufacturer for all types of motor vehicles. Their top quality filters are known for their great performance and build quality making them last longer. Teng Tools has built a reputation for supplying a wide range of professional quality mechanics hand tools at value for money prices. See the website for all the latest tools and prices. Leading Manufacturer of race grips, goggles, gloves, race wear and protection. Progrip is renowned for its long lasting and stylish products. The Scandic racing Clutch is relatively new to speedway but is rapidly growing in stature due to its quality and performance. Part of the Wal-Mart family and one of the Uk's top Supermarkets. Asda has stores all across the country. Find your local store on out website. Suppliers of quality engineered plastics. Supplying CJ Racing with top quality, non shatter plastic tear offs. 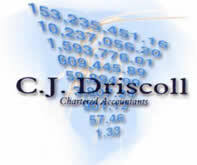 Based on Hayling Island CJ Driscoll Charted Accountants can help guide you through the stormy seas of TAX.